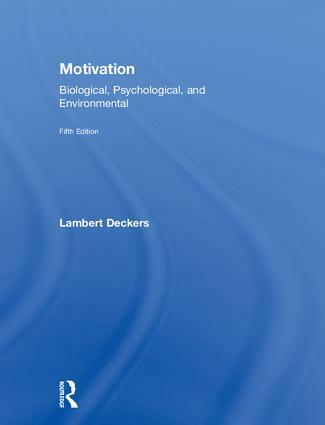 This textbook provides a complete overview of motivation and emotion, using an overarching organizational scheme of how biological, psychological, and environmental sources become motivation—the inducement of behavior, feelings, and cognition. It combines classic studies with current research and uses numerous real-world examples to engage the student and make often-difficult theoretical concepts come to life. By understanding and applying the principles of motivation described in the text, students will not only discover insights into what motivates their own behavior but also how to instigate self-change. Thoroughly revised and updated throughout, this fifth edition provides a major review of recent research, with over 225 new references, including expansion in the areas of goal motivation and emotion psychology. Other updated topics include new findings and interpretations on how evolution affects our preferences, how personality traits determine motivation, and how self-control depends on a cost/benefit analysis. The addition of individual chapter glossaries and an increased number of links to additional resources supplement student learning. This textbook is suitable as a primary text for courses on motivation. For additional resources, please consult the companion website at www.routledge.com/cw/deckers. Lambert Deckers is a professor emeritus of psychological science at Ball State University in Muncie, Indiana. He taught psychology courses for 45 years, with 40 years devoted to teaching a course in motivation and emotion. He also taught courses in the psychology of learning, and history and systems of psychology. Professor Deckers is a charter member of the Association for Psychological Science and a member of the Society for the Study of Motivation.